This verse and its truth. God continues to use it to speak to me and just as He continues to speak to me through it, He has impressed on me that this isn't a "one and done" kind of verse. I'm not to just give thought to the word one time and discover good once. The idea of the verb tense and usage with in the verse is that it would be a way of life for us - to continue to give thought to the word and to continue to be blessed by continuing to trust Him. - Identify the demands and distractions that are vying for my focus. - Intentionally setting aside time to pray and study God's word. - Remind myself that I am part of the "Whoever" is verse is written to when Satan lies to me about my worth. - Reflect on how VERY blessed I am. - Ask Him to help me to trust Him more. I hope these posts this week have been encouraging to you. I hope you've discovered good as we've given thought to this particular passage. Perhaps you could comment what verse(s) you are "giving thought" to right now. It just might be the next verse God is calling me or someone else to give thought to, too! In my last post I started sharing the truths from this passage that our God has been teaching me over the last week or so. If you've got the time, let me encourage you to scroll down and read my last post before you begin this one. Since I've been "chewing" on this verse, there was just more "there" that I wanted to share then would fit in one post . . .
"who trusts" - One of the many things God has blessed me with is faith. It is by faith that we've been saved and that saving faith comes from above. Since our Heavenly Father is the source of faith, this verse led me to ask for more faith to "trust" Him more. Like the father who approached Jesus seeking healing for a dying child, I too confess my faith and ask for more - "I believe, help my unbelief!" I am assured from the first part of our verse and others, that He will answer that prayer. He will help me TRUST Him more. "in the Lord" - Who else do we have to trust in?! Yet, here I am trying to figure things out on my own, trying futilely to control my circumstances and to manipulate how other people respond. I can't trust in myself, my circumstances or in others. Time and again, I fail. I can't control God-sized factors. Others always eventually let me down. As I give thought to the word, realize how blessed I am and seek out the faith to trust Him, of course, I will trust IN THE LORD. This last half looked at as one thought reveals a cycle to me.... We are blessed when we trust in the Lord and the more we trust in the Lord, the more blessed we are. So, as I have given thought to the word I have discovered good - this "cycle" is evidence of my good discovery! God is showing us an answer to the first half of the verse by the addition of the second half! I have discovered more about our God and I know that He is indeed good all by giving thought to the word. I am going to start off my week to blog following Vickie's example. I really appreciated how she took a verse and looked at it, breaking it down to let God really speak through it. This verse jumped off my Facebook feed and I've been "giving thought" to it every since. "Whoever" - Dear Friend, I don't know who you are, but I do know that you and I are both included in this word, "whoever." Not even our salvation is a prerequisite for the promise contained in this verse. Regardless of our Biblical knowledge or high school math grades, independent of how we feel about our self-worth or in spite of what others might say about us, whoever in the original language is still whoever. WHOEVER gives thought . . .
"gives" - Giving something requires intention. Today, my sweet mother-in-love turns 81. I want to mark the occasion. I have given thought to a gift. I have picked out a card. I will take my little women to visit her after school. In order to "give" I have to take budget and time and schedule into consideration. I have to make an effort. I have to be intentional. The same applies to this verse. If I am going to discover good in the word, I have to be purposeful to GIVE thought . . .
"thought" - There are A LOT of things that compete for my thoughts. Keeping up with a busy family of five on top of the church calendar, with the distractions of various social media outlets my thoughts are mostly on things that won't matter a week from now. Add in Satan's lies and my own insecurities, it's no wonder I can never call my daughters by the names on their birth certificates! But when all the demands are set aside and the distractions are done away with, the thought path that remains is worth following. Intentionally giving THOUGHT is done by following Vickie's verse, being still and knowing He is God . . .
"to the word" - As even a casual student of the Bible, we can know that the Bible is many things. It is sweet, useful for a variety of purposes, deep for the most learned to still contemplate - yet simple enough for my two year old daughter to understand. The word is truth. It is God's revelation to me, the one He pursues, of His incredible self. Without question, THE WORD is worth giving thought to. "will discover" - This verse assures me that when I give thought to the word, I will find. Seek and you will find, ask and He will answer. This verse dovetails so many other passages where God promises that He will not be hidden. If we look, we will find. As I give thought to the word, I WILL DISCOVER. "good" - In my years walking with Jesus, I have never regretted the good I have found when studying His word. The good I have discovered includes a deeper understanding of myself and my God, an assurance, affirmation, and remembrance of truth. His peace, His love and even conviction of my own sin are among the good that I have found. No one wants to think of their sin being pointed out as a good thing, but if it makes one more like my Jesus, it is most definitely a good thing. Here we are told what we will discover is GOOD. Ministry is hard. There is always a constant “urgency” to meet everyone’s needs. Our husbands strive to prepare for Sunday and Wednesday services, attend committee meetings, juggle hospital and homebound visits, put out fires of dissension within the body, and tons of other “minister” duties. Likewise, as the wives of ministers, we have all the stress of handling home, kids, our jobs, and church responsibilities plus all too often listen to people express their “concerns about such and such” at church. That is why I just feel led to share a brief post today with you regarding Psalm 46:10 “Be still and know I am God.” I have broken the verse down word by word and discovered some very interesting thoughts. As I sit here writing this blog post, I am shoving a handful of nerve pills aka Peanut M & M’s in my mouth and considering how best explain an event that took place last night. Actually, I think I need to vent for a moment. Our quarterly business meeting was held last night. It should have been a quick five minute meeting. You know the kind- the “nothing is on the agenda” business session. However, four senior saint women had other ideas. Over the summer some new changes have occurred to our bulletin style. The staff and the office assistants decided to go away from the “folded” style which list the Sunday morning “set in concrete; Holy Spirit can’t adjust it” the worship service. (Nope, the Holy Spirit cannot impress on the worship leader to change a song or cut one. Nope, the Holy Spirit certainly can’t stir the pastor to call people to pray for a crisis in our community or the world. You must stick to the Baptist mass and there is no veering from it). Our new bulletin is modern and simply lists the events of the upcoming week with a place for sermon notes. Our once a month newsletter puts emphasis on all the events for the month with all the needed details and information. Anyway, the spokesperson for the senior saints made a motion to change the bulletin back to the old style. Her reasons were that she could not check off the morning service and people just did not like the new modern and up to date style. After literally a thirty minute discussion of the pros and cons of making the change backwards or going forward with the new bulletin, a vote, yes sisters, a vote was taken! I have never in my thirty plus years as a pastor’s wife seen a vote taken over a piece of paper. A retired pastor’s wife was sitting next to me and she was absolutely shocked that a vote was occurring. This vote was a first for both of us. Thankfully, the majority of the people there last night voted to keep the bulletin as is and to keep moving forward to reach our community of young adults. Here is what is even more frustrating. My husband shared prior to this bulletin vote that God has blessed our church with a huge growth that they have not seen in over 25 years. This year alone we have had over 70 people join and 25 of those were by baptisms. There were only a few quiet Amen’s spoken across the congregation. As a pastor’s wife who visits with other sisters in ministry, I am hearing more and more congregations arguing over trivial matters like bulletins and style of music and rarely stopping to praise the Lord for the souls saved. (Ok, I am finished venting). Even with last night’s negative moment, God is blessing. This Sunday our church will have a celebration/ribbon cutting for our new, modern preschool wing and up to date children’s area. Our church is healthy and financially sound. There is an excitement in the air and people are anxious to see what else God is going to do in our midst. I simply want to remind each of us in ministry that when God is working in a person’s life or in the life of a church Satan is working overtime to discourage us. We must keep working for Jesus no matter what because soon and very soon He is coming to get His followers. Fall is one of my favorite times of the year. I guess I love the season because of the beautiful colors of the leaves as they change from vibrant green to various shades of red, gold, orange, and brown. What a beautiful part of the landscape they become in our yards, in public parks, on the mountains, and many other places in nature. Just as the leaves go through a transformation ordained by God, isn’t it also true that our Lord takes us through seasons to transform us? As I look back over my life, there are certain situations that our Father allowed me to go through to bring about transformation in my life. The same is true for you, my sister. Do you ever stop to think what life would be like if things always stayed the same, no ups and downs, just smooth sailing all the time; would we even feel a need for the Lord Jesus Christ? How would we know what true joy is, unless we went through sorrow? How would we know how to appreciate contentment, unless we have experienced need? How would we find peace, if we never felt anxious or worried? How would we know how to embrace the love of the Father, if we never felt abandoned or unloved by the world? How would we know what forgiveness looks like, unless we have meditated upon the cross of Christ? As we teach lessons, listen to sermons at church, tune in to radio ministries, and enroll in Bible studies, what should be our goal? Is it to learn more information about the Savior OR to be transformed more and more into the image of the Savior? It’s not about gaining facts and impressing others with our knowledge of God’s Word, but allowing that Word to get into the inner recesses of our hearts, so we will want to live passionately for Jesus Christ! Going through transformation may be uncomfortable and downright painful! Yet when we look back over what we’ve gone through, to get us where we are now, it’s all worth it, especially as we see the merciful, all-knowing hand of God working through every detail and seeing how He carried us through! My sisters, remember that He who began a good work in us, will complete it (Philippians 1:6). He will complete it because He promised it, and He NEVER breaks a promise because He is Faithful. So, just as the leaves go through their beautiful transformation, allow the Master to transform you into the beautiful woman of God that He has called you to be…..for His Glory!! First....we have lived in Tennessee for 22 years and love it. We would not want to live anywhere else. 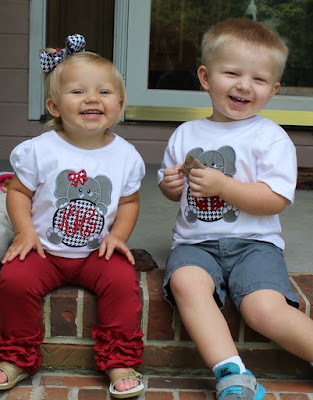 So........that being said, I will conclude this blog with........ROLL TIDE!!! I LOVE FALL!!! I love the cooler, but not cold weather. I love fall festivals. I love apples. I love seeing the beautiful leaves. I love hay rides. I love standing by the fire. I love that bugs are dying off. I love that there is no grass to mow. I LOVE FALL!!! We have already traveled up the the Apple Barn a couple of times this season. Yummy! I love the "different" apples. Our first trip, we brought back Honey Crisp Apples. The last trip, we brought back Jonagolds. There is no better fall snack than crunchy peanut butter and apples. Yum! I look around at the apples, the leaves, the pumpkins, etc............and wonder how in the world ANYONE could doubt that there is a God. There have been great artists over the years, but no one that can paint as beautiful as the ones that comes from God's giant paint brush. 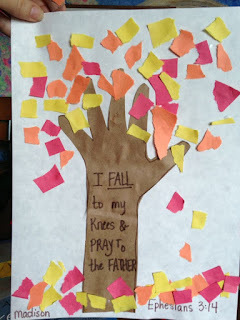 My preschoolers at church made similar fall trees to the one pictured below. I know you are VERY busy. All pastors and wives are stretched to the max............but please take out time to relax and enjoy "nature" before the busy, hectic holidays sets in.